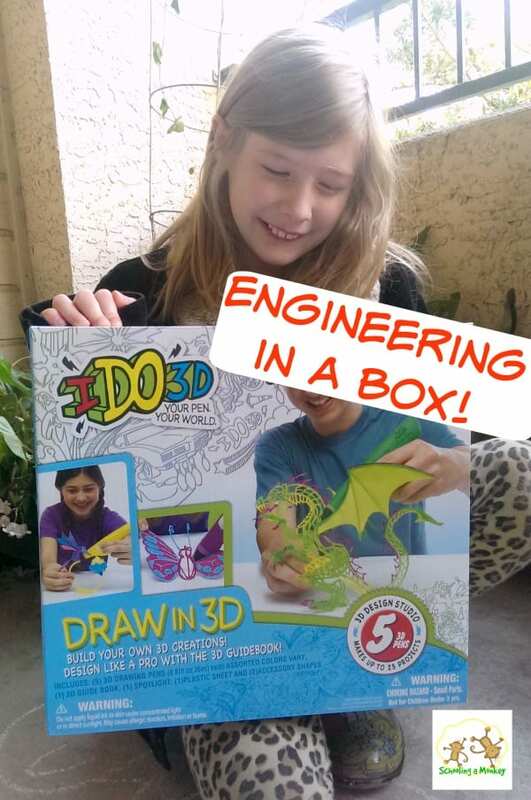 STEM activities for kids are some of our favorite things, which is why we were all incredibly excited when IDO3D hired us to try out one of their products. 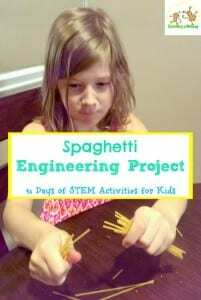 We decided to use it as a tool for an engineering activity for kids because we are never far from thinking about STEM activities. 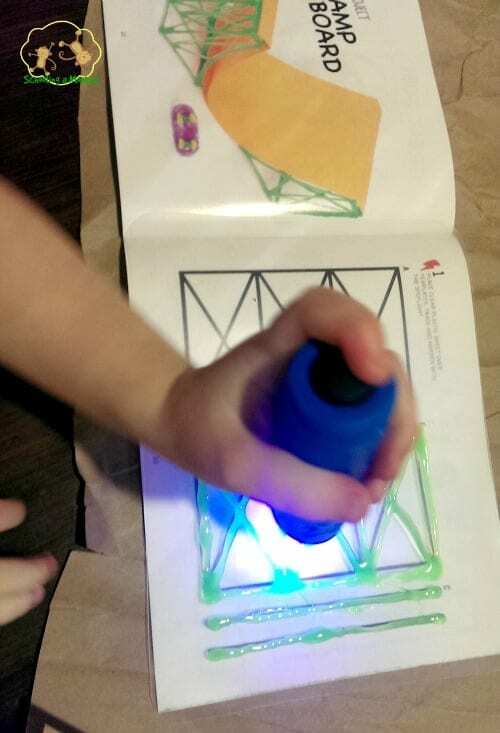 are a set of 3D gel pens that cure through UV light exposure that you can use to create elaborate designs and experiments for kids. Each kit contains an idea booklet for various 3D projects. IDO3D assembly is completed by creating 2D structural supports and then “gluing” them together with additional gel paint to create 3D structures. Monkey selected a design for a 3D skatepark. Bo, doing her part to cure the designs. 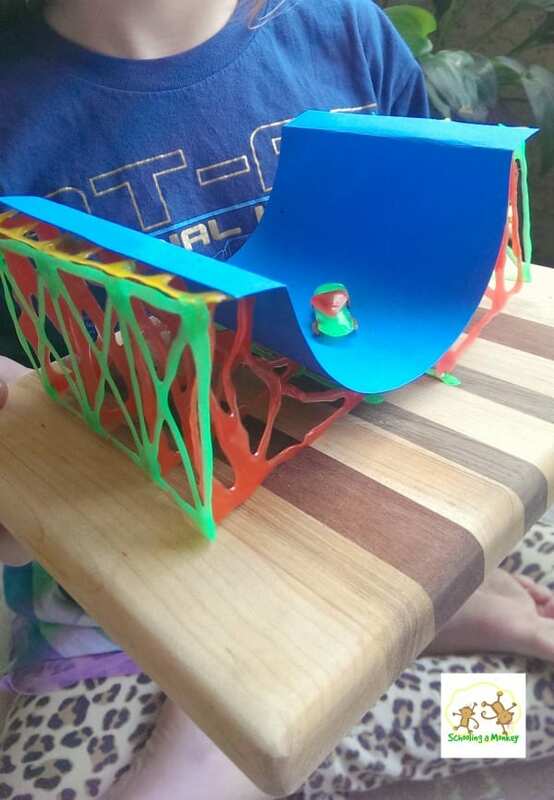 Because we wanted to make this project an engineering activity, Monkey selected a template for a 3D skateboard half-pipe. 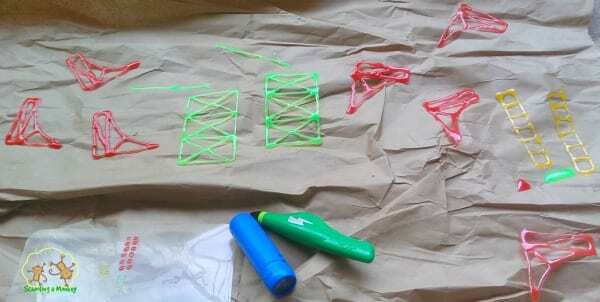 Place the plastic sheet over the desired outline and use the gel pens to trace the design. 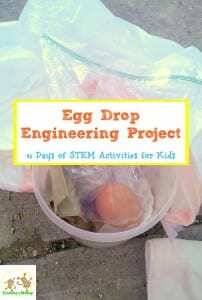 Use small dabs of gel to glue the pieces together and complete the 3D engineering project. The project is fully cured when it is no longer flexible. All our pieces ready for final assembly. Monkey had a blast creating her 3D engineering project and was extremely impressed when the 3D skateboard park came together. If you wanted to make the project even more challenging, make your kids come up with their own design rather than allowing your kids to use the pre-made templates. 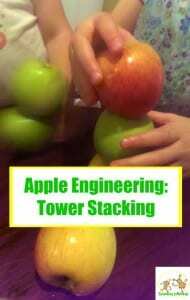 This will help your children learn how structural integrity works and the importance of symmetry for 3D designs. If the outlines are sticky when you touch them, they need additional curing time. Building the project outside in direct sunlight speeds curing time. Some of the ink cured faster than others. Our green ink seemed to cure the fastest, while red took the longest. We used green for all of our project “gluing” because it seemed to dry faster. Bo, at almost 3, is too young for this project. However, she still enjoyed holding the flashlight to cure the gel. There are endless design options. This kit could be used for dozens of engineering challenges. There was no smell and clean-up was simple. Directions were clear and easy-to-use. Our projects ended up looking just like the examples. Some pens were a little difficult to squeeze. Drying time was a little long. It took us a couple of hours to complete our design.